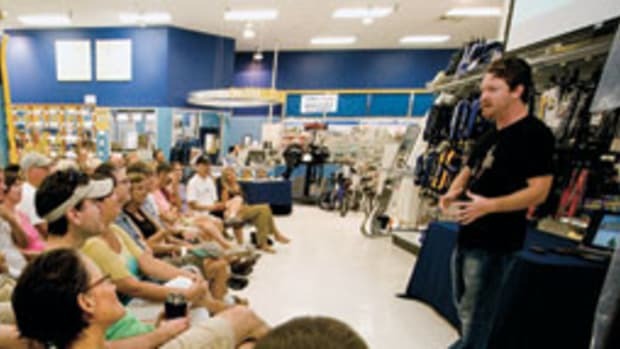 “Barnacles really slow you down,” said the woman in the magenta sweater as she switched off a cordless Dremel tool. She’d been stripping old bottom paint from the keel of her yacht, along with the remnants of those pesky crustaceans. If you’re not careful removing the last bit of them, she explained, they’ll be all too happy to return, ruining the hope for decent progress on a long journey. Jeanne Socrates should know because long trips are just her thing. She has sailed around the world four times, give or take. 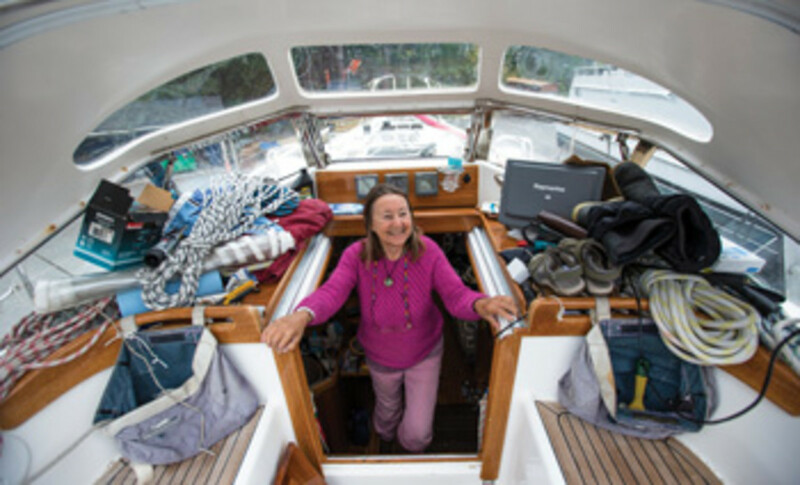 Her last attempt ended in the wee hours of July 8, 2013, in Victoria, British Columbia, and earned her the distinction of being the oldest woman to circumnavigate the planet solo and nonstop (see the February 2014 issue of Soundings or search “Socrates” at SoundingsOnline.com). When she drifted across the finish line at Ogden Point, she was just shy of her 71st birthday. Now more than three years on, this retired math professor from West London, England, was fixing to go again. Solo and nonstop again. East-about again. Starting and finishing in Victoria again. 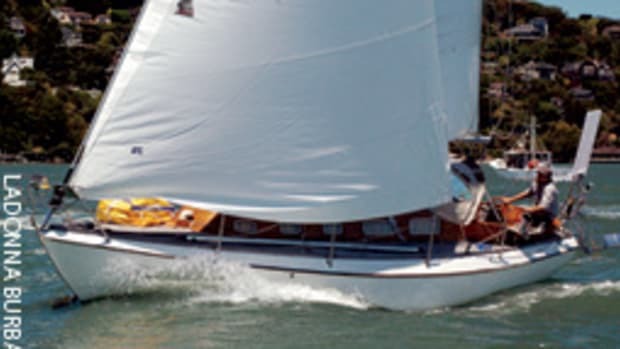 “What about, you know, age?” I asked Socrates over brunch at Canoe Cove Marina in North Saanich, British Columbia, where she was outfitting Nereida, her Najad 380, the boat she has owned since 2009. “I still refuse to go down that road,” she replied. Age is nothing that should get your knickers in a twist. “I’m 74 — that’s a high number, but I don’t think about it.” More precisely, she thinks about age differently. And she knows how to adjust, such as grinding the sheets in a gale with the help of an electric winch. And there is something else: Success is like a drug. Look at the athletes who unretired at least once — Michael Phelps, Brett Favre, George Foreman, Michael Jordan, Lance Armstrong and so on. They didn’t come back for the money; they missed their craft, the crowds, the spotlight, the fame. I surmise that Socrates might have felt such pangs as well. I asked why the hell she’d want to do another 25,000-plus miles on the wild blue yonder, risking life and limb and failure, after she had been knocked down, shipwrecked and otherwise put through the wringer on her previous voyages. She said she has to do an encore because, well, she’s not all that good at leisure. Sure there were those who baited her with “what if” and “if you ever,” but they were trying to beat down an open door. She had been sitting on the hard or tied to the dock for more than two years. She did make use of that time, learning Spanish with the help of an app to better convey her design ideas for a hard dodger that was fitted to Nereida by a gem of a guy in Mexico who neither spoke nor understood English. That and a 10-day cruise with friends to San Blas, Mexico. “It was nothing,” Socrates said. If that’s nothing, there was always something. She broke her collarbone after returning from the publicity blitz following her last voyage and being feted by the Ocean Cruising Club, the Cruising Club of America and the Royal Cruising Club, which bestowed their most precious medals on her. Her first time on an ATV ended in disaster as she learned how to work the throttle with her thumb and drive fast enough to make steering easier. Later, on her way north, Nereida took on water from an open seacock, and it was spiked with a copious amount of diesel fuel that had leaked into the bilge from one of the fuel filters. A royal mess for sure, but not enough to derail her plans. 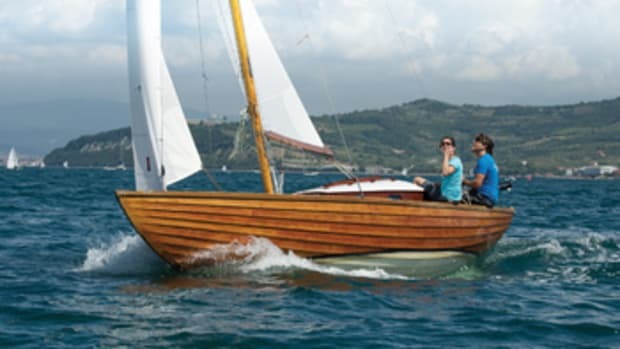 While she’s at it, there are a few things to improve, she added, but not necessarily Nereida, a simple but robust sailboat that has been tested and optimized in three circumnavigations. Socrates will enjoy more protection in the cockpit, courtesy of the hard dodger, and some new instrumentation mounted on fresh stainless steel carriers. She also upped her communications with a RedPort Aurora Iridium Wi-Fi terminal (in a deal brokered by fellow circumnavigator Donna Lange), so Socrates will be able to chat and email via satellite from beyond the horizon. During her last voyage, her computer went kaput, and she had to rely on ham radio as her only link to the outside world. For a while it was a bit like sailing in Sir Francis Chichester’s wake. She’s also lightening the load by leaving the spare anchor behind. 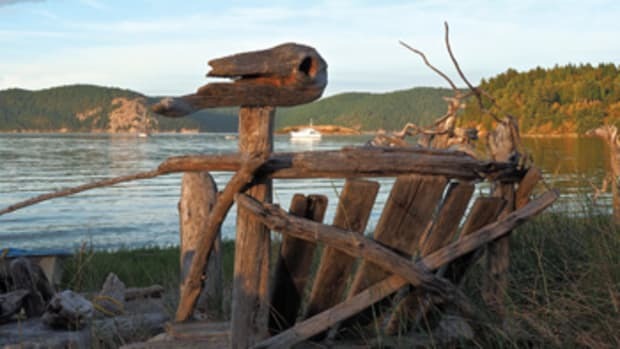 “It caused the boat to hobby-horse,” she said. And speaking of lightening the load, she’ll try to hang on to her life raft this time around. The raft got loose during her last voyage, which necessitated some deft maneuvering to pick up a new one in San Francisco without jeopardizing the unassisted aspect of the voyage. Then there’s New Zealand. Socrates starts on the West Coast and sails east-about, so Cape Horn is the first of the great capes she has to round. That makes Stewart Island, on the southern tip of Kiwi Nation, the point where she’ll turn north for the homestretch. Unlike last time, however, she’ll leave New Zealand to port. 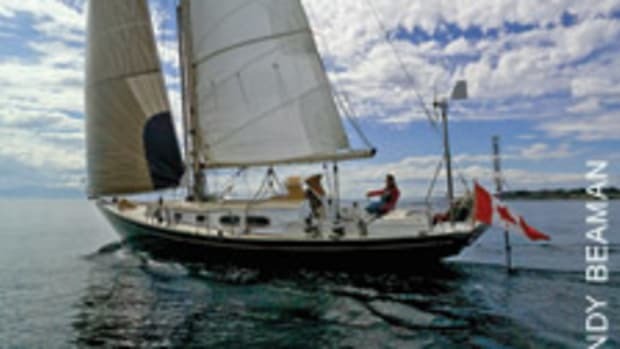 “If I encounter heavy weather, I might have to heave-to for a few days, but it will be better to have a more easterly routing, which helps me avoid the problems I had last time.” In 2013 she sailed up the Tasman Sea, which pushed her farther west and cost her oodles of time in the end. 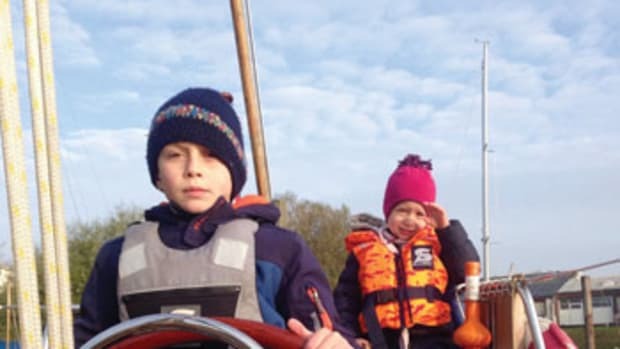 She’s not sailing on the clock, but she’ll carry the “black box” that the World Sailing Speed Record Council requires for official verification of the course, which is kind of extraneous since AIS and her own tracker will put out position signals at regular intervals. Socrates had hoped to leave Victoria on a favorable ebb around Oct. 17, but the Strait of Juan de Fuca is fickle. It can be tame as a millpond or a slaughterhouse with wind from the west and the tide running straight into it. Socrates provisioned for eight to nine months, expecting to be back next summer, before her birthday, which dredges up the age question again. It’s only a number to her, but it’s a matter of interest to the folks who manage the Guinness World Records and keep track of achievements that start with the qualifier “oldest.” There are two entries about people in their golden years who circumnavigated alone and without stopping. 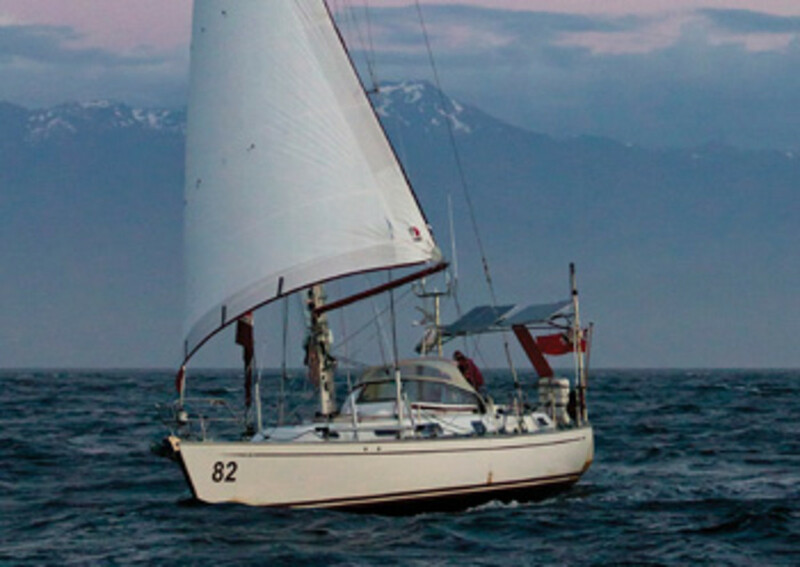 “Oldest person to sail single-handedly around the world - female” — that’s Socrates. 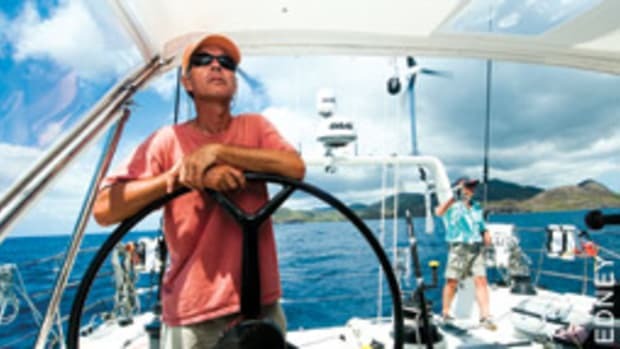 And “oldest person to sail around the world (solo and nonstop)” — that’s Minoru Saito, from Japan, bluewater sailing’s Methuselah. Of course, they know each other. There aren’t many people in that age bracket who engage in this kind of travel. In addition to the Guinness entry and the Cruising Club of America’s Blue Water Medal, they share the experience of nearly coming to grief at Cape Horn. But there are a couple of differences, too. Saito went around the world a whopping eight times, east-about and west-about, the last time when he was 77. But it was his seventh tour, which he sailed solo and nonstop and finished in June 2005, that made him the oldest individual of either gender to accomplish this feat — at 71 years and 150 days. If Socrates repeats, she’ll be the undisputed queen of the castle, as she’ll turn 75 in August 2017. I don’t believe an age record is a sufficient motive for a self-professed age agnostic to try this do-over, though I’m pretty sure she’d be tickled to force that subtle semantic change in her Guinness blurb from “oldest woman” to “oldest person.” Going around again also would soothe that compulsion to reconnect, perhaps for the last time, with places that have more meaning to her than abstract names on a chart — places she rattles off as if they were stops while running errands around town. She’s not just a sailor, but a citizen of the sea.